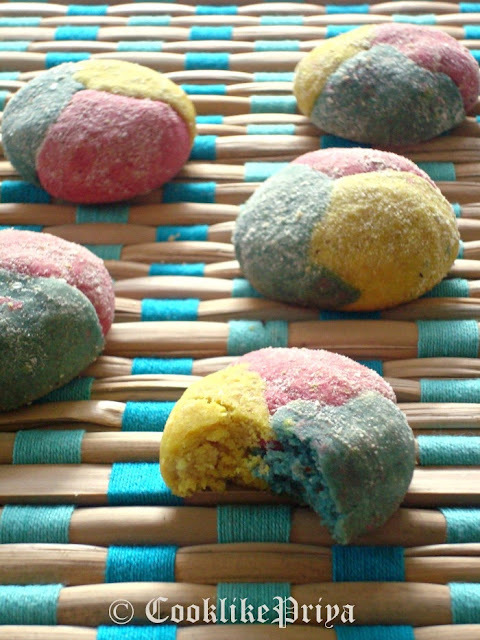 As a continuation of celebrating my dear Priya Aks B'day I made these colorful Suji Crystal cookies today. They turned out absolutely yum, to keep in mind the theme of doing recipes of different colors I went ahead with this recipe. Aks I hope your day if filled with loads of surprises to keep you happy. And as excited as you are we all your friends are so so excited to share you all our virtual treats today. I hope they are pure feast for your eyes and that you virtually enjoy all the goodies we gobbled up saying your name :P.
Happy Birthday once again to one lovely Priya Aks. Suji Crystal Cookies as it is named does not contain any sooji/ rawa and I wonder why they were named so. 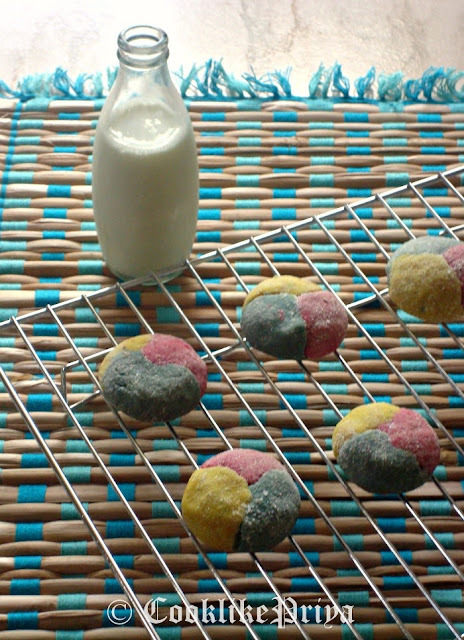 A Malaysian delicacy made with melted ghee, flour, almond meal and raising agents colored and formed into marble effect cookies. They taste fabulous and simply melt in your month. Great for a kids party or any birthday celebration, these cookies are sure a hit with almost anyone. 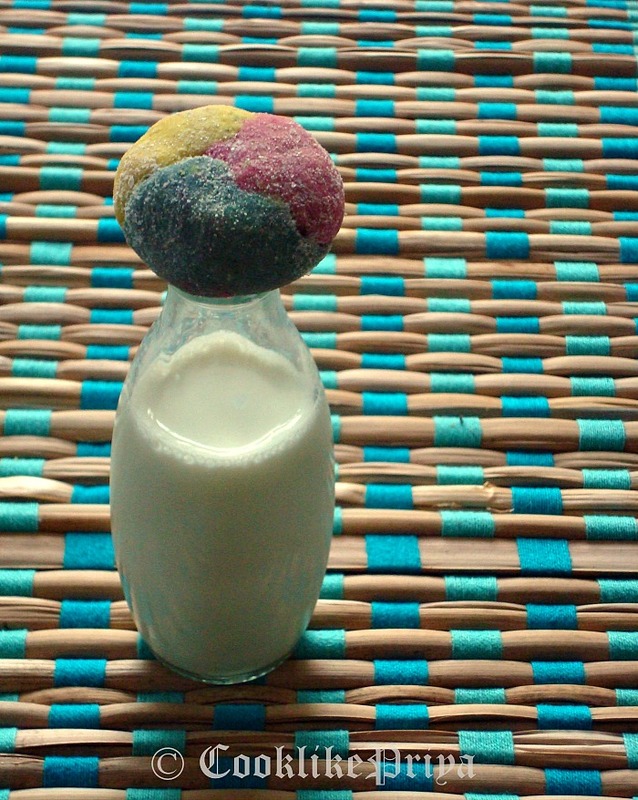 Now take a tsp of dough from all 3 colors and roll together to form a marble effect. Place the rolled dough on the prepared tray. Repeat the same for all the dough. - Make sure you roll the dough well do that the cookies are firm and hold shape. - Measure ghee after melting and also measure icing sugar after powdering. Oru post pothatha sis, yen ippadi..Oru postke naan aadi poy irruken, nee rendu post vera...Yenda ippadi pannuringa..Love u my dear Sis..U r such a wonderful person dear, am very much lucky to meet u and enjoyed ur foods. Thank god, u never failed to shower ur love sis..Am soooo blessed. lovely post akka.super cookies and once again wishes to priya sis. superb Innovative biskuts looks coloful n attractive. 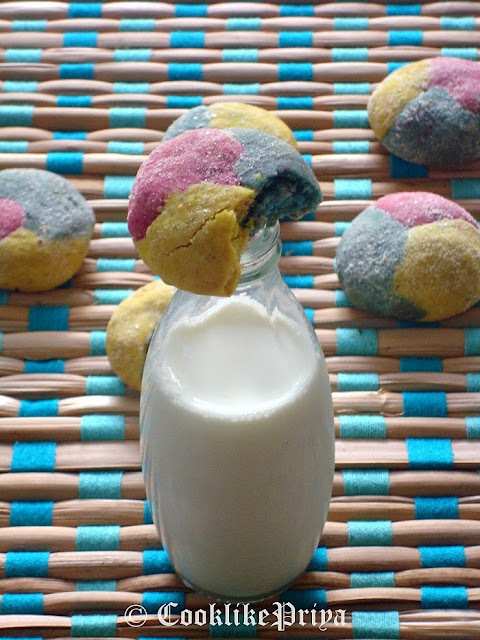 Cute cute cookies, so colorful and nice akka :) Beautiful cookies and loved your write up and that lovely card too..